I recently attended a meeting of the Historical Photographic Society and had the pleasure of seeing an image by one of my favourite Victorian adventurer-photographers. 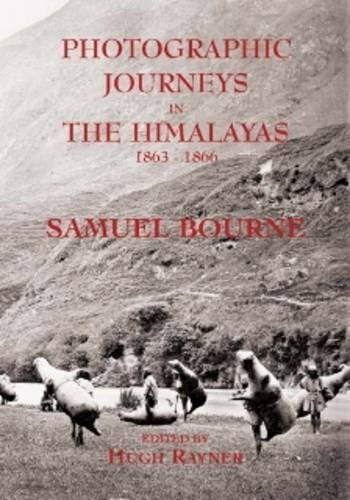 Samuel Bourne dragged his heavy wooden camera and tripod across rivers, deserts, up and down mountains, anywhere there was a subject he wanted to photograph. His images are superb. Perfect exposure, beautiful composition, while side-stepping everything the Indian subcontinent could throw at him. Along with men like Sache, and John Burke who has the distinction of being the first man to photograph Afghanistan–while following an army in the midst of its slaughter. When the British charged into Afghanistan, they had no idea of the difficulties facing them. They were cut to ribbons and John Burke captured it all. He photographed the living, the dead and the dying, shrinking from nothing, all the while carrying a heavy wooden tripod and large format camera. Along with Sache, Bourne, Felice Beato, and a handful of others, these intrepid Raj photographers have given us a vision of British India that cannot be forgotten. In fact, I was so fascinated by them and their images that I ended up spending seven years on a novel set during the 1870s in the city of Lucknow, where one of the most important sieges of the Indian Mutiny took place. I am a graphic artist. My work is based on photography and I am also a writer of historical novels, specializing in the Victorian era with a strong emphasis on the historical connections between that time and this.I began writing by working with my late father, Alvin Schwartz, who wrote Superman and Batman comics for more than twenty years. Starting very early, about age six, I plotted comic book stories then moved on to writing film, advertising and fiction ranging from young person’s novels to my current historical novels http://hudsonhousemysteries.com/south.php. In addition to telling a good yarn, I like to use an historical perspective to comment on modern issues. I learned about art from my mother who was one of Hans Hofmann's students and had one of the last show at Peggy Guggenheim's in NYC. I have had one man shows in Montreal and Toronto. My art website is Alan McKee.com. This entry was posted in 19th century India, 19th century photography and photographic techniques, spiritualism, spiritualistic phenomena, spirit photography, Rajphoto.com, Uncategorized, victorian India and tagged british photographs, British Raj, download indian images, indian photography art, murder mystery books, photography photographs, sam bourne, samuel bourne photography. Bookmark the permalink.